Osaka Kansai-based LCC Peach Aviation is looking to consolidate its position in the Japanese LCC market. Although it is the second largest (Jetstar Japan is first), Peach is the only known profitable LCC. Peach is expected to open a base at Tokyo Narita, becoming the fourth LCC with an operation there. Skymark has pulled down its Narita base following weak demand. At Narita, Peach - part owned by All Nippon Airways - will compete with Jetstar Japan but also Vanilla Air, which is wholly owned by ANA. Peach appears to be taking the view the market is competition between itself and Jetstar and with Vanilla Air something of a distraction. No doubt the ANA strategy is confused – a conflicted scenario that was inevitable from its involvement in two domestic LCCs in Japan. Peach will further boost its position by operating international flights from Tokyo Haneda, becoming the first new LCC at Haneda. Peach already operates international services while Jetstar Japan will only open its first international route on 28-Feb-2015. Meanwhile Spring Airlines Japan, with low yields and load factors, has increased its capitalisation while it waits to serve more lucrative international destinations. Peach is reported to planning to open a base at Tokyo Narita, supplementing its existing bases at Osaka Kansai and Okinawa. Peach has maintained that its primary Osaka Kansai base is better, given the untapped demand and curfew-free situation, but that a Tokyo Narita presence was inevitable if the LCC was to serve all of Japan. Peach was also not going to tolerate a large Jetstar Japan in Tokyo Narita, especially with Jetstar Japan opening a base in Peach's backyard at Osaka Kansai. Jetstar Japan's first international route will also be from Osaka Kansai (to Hong Kong). Peach already serves Tokyo Narita with about three daily flights to Osaka Kansai. Peach's additional Tokyo Narita flights are reported to be to Fukuoka (FUK) and Sapporo (CTS). These two cities are the largest destinations for Jetstar Japan while Sapporo is the largest for Vanilla Air. Vanilla Air does not serve Fukuoka and Spring Airlines Japan serves neither Fukuoka nor Sapporo. 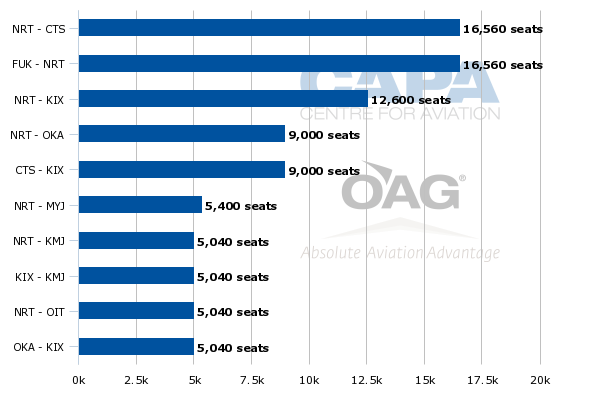 Peach plans to grow its fleet from 14 A320s to 17 in FY2015 (the year to 31-Mar-2016). Peach does not plan to use the new low-cost carrier terminal at Tokyo Narita, due to open in Apr-2015. Peach's Narita base entry will of course bring implications for Jetstar Japan at Tokyo Narita. But arguably the more intriguing dynamic to play out is that of Vanilla Air. Where Peach is minority owned by All Nippon Airways and ANA fully owns Vanilla Air, born out of AirAsia Japan after the AirAsia Group pulled out, there is no clear competitive strategy. One option for ANA was to have Peach take over the remnants, but no agreement was ever reached. Flight details are yet to be released, so it is unclear how aggressively Peach will target Vanilla. Jetstar Japan is certainly the larger target, but Peach is unlikely to show any leniency towards Vanilla. ANA is only a minority holder in Peach and so cannot constrain Peach to protect Vanilla and its majority owners will be keen to optimise their investment. Peach's entry into Tokyo Narita could be read to imply Peach sees the Japanese LCC market as a competition between it and Jetstar Japan - with Vanilla as a sideshow. Jetstar Japan has a large part of the domestic market from Narita to itself as Vanilla serves only three cities, including one secondary one, while China's Spring Airlines local JV only serves smaller cities. 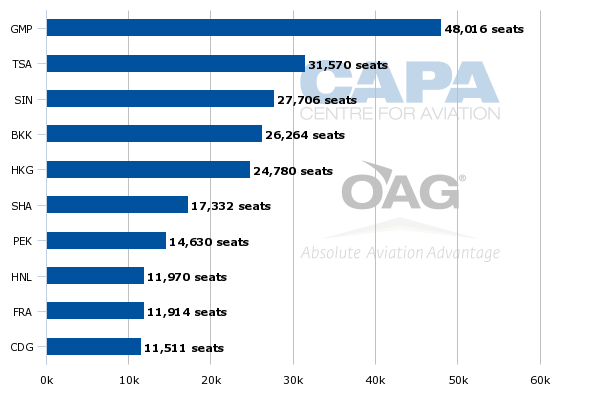 There is evidence to support a view of Peach being the strongest of Japan's LCCs. Its yields are the highest of the new LCCs, and it has posted profits. 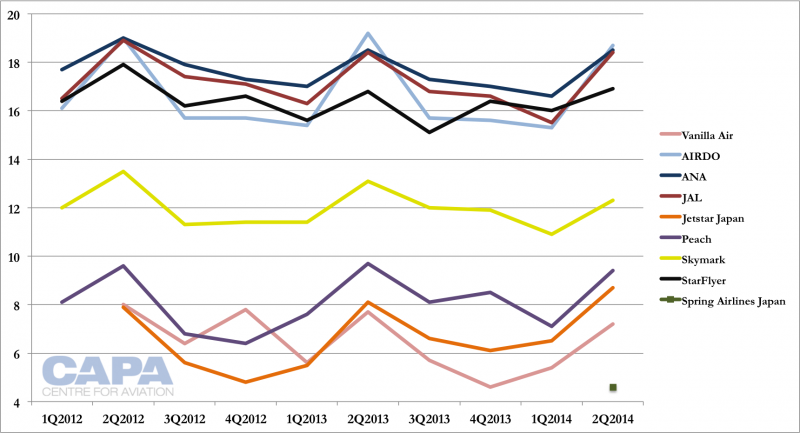 Jetstar Japan is loss-making but showing improvement. Financials for Vanilla Air have not been disclosed but the carrier is likely loss-making. Note: All carriers except for Jetstar Japan for the year to 31-Mar-2014. Jetstar Japan is for the year to 30-Jun-2014. Peach reported an operating profit in FY2013 (the 12 months to 31-Mar-2014) of JPY2 billion (USD19.4 million). This was Peach's maiden profit and follows a loss in FY2012 (its first full year of operations) of JPY960 million (USD9.6 million). Peach says its operating profit was 12.7% higher than planned. This was a result of a 31.2% increase in revenue, however this would have been dampened by higher costs related to the Japanese yen's depreciation. Peach CEO Shinichi Inoue, speaking at CAPA's recent LCC Congress in Singapore in Oct-2014, proudly noted that Peach had made a profit after only 25 months and that "no one expected" a LCC could be profitable in high-cost Japan. Jetstar Japan reports according to part-owner Qantas Group's fiscal year, which ran to 30-Jun-2014. In this period Jetstar Japan had an operating loss of JPY10.72 billion (USD105 million), an 18% increase from the JPY9.05 billion (USD91 million) in the year to 30-Jun-2013. 2014 revenue increased 127% year-over-year. Net losses increased a faster 26%. Jetstar Japan's total accumulated deficit as of 30-Jun-2014 was JPY22.58 billion (USD232 million). 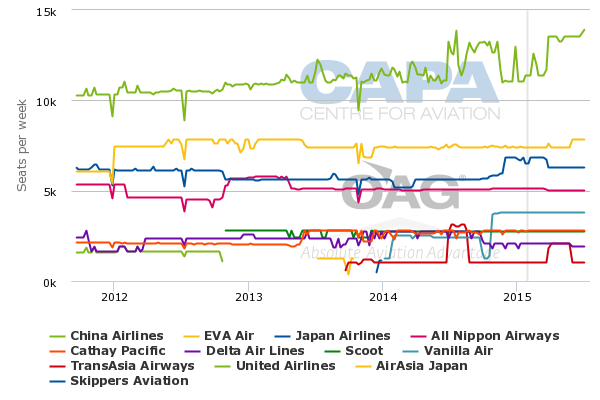 Of Japan's major carriers that regularly report detailed financial results, Jetstar Japan had the largest loss. Peach was rare in being the only other carrier to join heavyweights ANA and JAL in making profits, although Peach's profit was understandably smaller. Skymark and StarFlyer, hybrid airlines, posted losses. 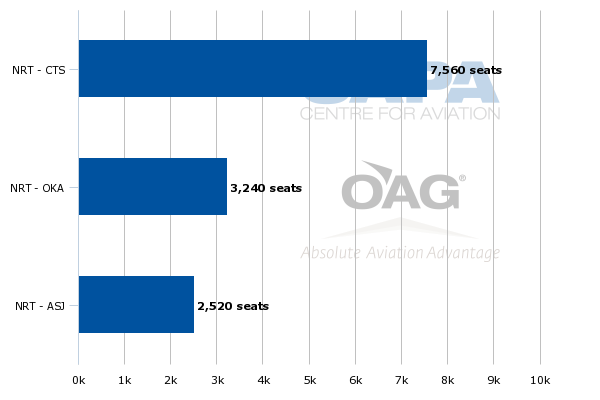 StarFlyer's operating margin was worse than Skymark's, but StarFlyer is a smaller player. Peach made about USD6.60 per passenger, based on a combination of Peach's disclosed domestic traffic statistics and estimates for its international traffic. This is well above IATA's estimate of Asia-Pacific airlines making USD2.01 per passengers in calendar 2013 and USD2.98 in calendar 2014. Jetstar Japan meanwhile lost USD32.60 per passenger. Jetstar Japan blamed its large loss partially on the delayed opening of its base at Osaka Kansai. This led to an under-utilisation of its fleet. This loss was considerably less than the USD55.80 Jetstar Japan lost per passenger in the year to 30-Jun-2013. Although Peach's profit was significantly smaller than ANA or JAL, Peach itself is significantly smaller. Looking at Japanese airline financial results on an operating margin level, Peach achieved a higher operating margin (6.5%) than part-owner ANA (4.1%). 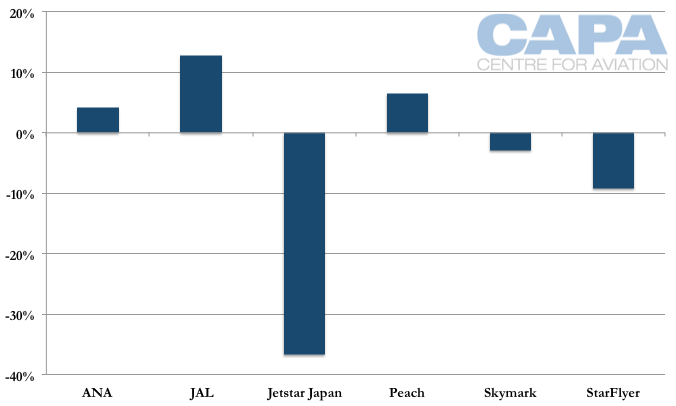 The JAL Group meanwhile had the country's best and worst margins: JAL with an operating margin of 12.7% and Jetstar Japan with a negative operating margin of 36.8%. This was half the negative 70.7% operating margin Jetstar Japan had in the year to 30-Jun-2013. The Japanese government in Jan-2015 announced it would accept applications from LCCs that want to use Tokyo Haneda's nighttime slots for international services. Haneda's off-peak period from 23:00 to 06:00 experiences under-utilisation of slots. There is only sprinkling of slot usage, mostly around midnight and then 06:00, and these are all almost exclusively for international flights. During the off-peak period Haneda does not run at full capacity, and the government said 27 of 40 slot pairs are in use during these nighttime hours. This is a large curtailment of operations as Haneda offers around 40 slot pairs per hour in the peak day. The airport's convenient downtown location exposes it to concern about noise, restricting the limited night movements. As seen in the chart below of Haneda's movements, departures taper off beginning at 20:00, meaning there are under-utilised departure slots prior to 23:00. To boost efficiency further, for tourism and economic output, there is the option to move up the night window from 23:00 to 20:00. Likewise, at the other end of the clock, there are few arriving flights at Haneda prior to 08:00. Japan has already tried to increase the appeal of Haneda's night-time slots. Japan in 2014 offered a 50% discount on landing fees for the first year, 30% for the second year and 20% for the third year. During these night-time hours there would be limited demand for domestic flights, but the government's focus on international services is to boost international arrivals as part of its tourism targets. The airport would have ground infrastructure challenges given suspended train service and limited bus services. But for a significant discount on air fares, consumers will find options (taxis, for example) or entrepreneurism will bring solutions (more bus services), as happened at Kansai. A number of bus services also cropped up in Tokyo to facilitate transfer to Tokyo Narita before trains start running. All services from Tokyo Haneda to Taipei go to Songshan airport (TSA in the chart below). Taipei is the second largest destination from Haneda after Seoul (Gimpo, GMP). Including Tokyo Narita, Taipei is the second largest international destination from the Tokyo area, as it is from Tokyo Haneda. 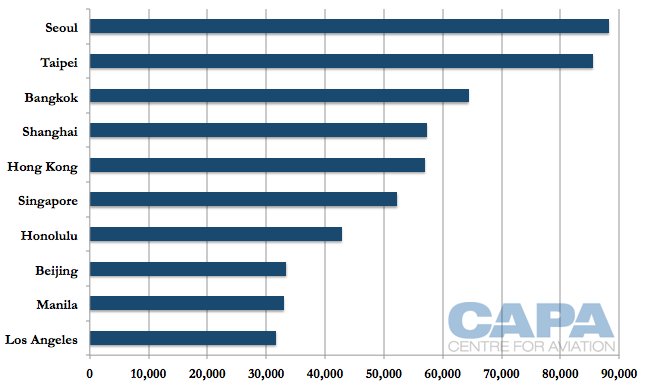 But Taipei's lead is far larger when looking at capacity across the city compared to just Haneda. No Taiwanese LCC serves Japan yet. Only two launched in late 2014: Tigerair Taiwan and V Air. There are initially focusing mostly on Southeast Asia but with time could be expected to turn their focus to Japan, a very popular outbound market from Taiwan. Japanese LCCs Peach and Vanilla Air serve Taipei, but only Vanilla does from Tokyo (Narita). Vanilla has a 8.9% share of the market, impressive given its young age, but should be capable of more. However, Vanilla's overall small size would mean the carrier could be weighted too heavily on Taipei. Singapore-based Scoot flies between Taipei and Tokyo Narita with a daily 777-200 service with local pick-up rights, giving it a 6.7% theoretical share of the market (some of Scoot's passengers originate from Singapore). 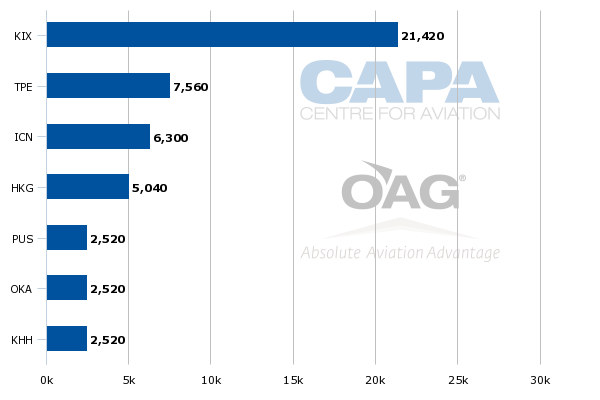 LCC capacity accounts for only 15.6% of the market, with rapid potential for growth given the high demand, current high fares and relatively short flying time (3-4 hours blocked) - although it is a sizeable market for ANA, which will be reluctant to lose share. Cathay Pacific and Delta Air Lines also have fifth freedom rights between Taipei and Tokyo. None of Japan's "new entrants" like StarFlyer and Skymark have international flights from Tokyo Haneda despite either being based at Haneda or having a large presence. Air Do, which technically entered before the "new entrant" wave, had been a domestic carrier focusing on service to Hokkaido from various other Japanese cities. In 2014 it experimented with international charters to Taipei, reflecting the interest in Japan-Taiwan traffic flows and growth. Note: Vanilla Air capacity in late 2013/early 2014 mis-identified as Skippers Aviation as both airlines share the same JW identifier code. Taipei is Peach's largest international destination. Peach serves Taipei from both Osaka Kansai and Okinawa. Taipei is Peach's only international service from Okinawa but Hong Kong service launches from Okinawa on 21-Feb-2015. Peach has long mooted nighttime flights. While these would boost aircraft utilisation, the origins of the idea were the result of pragmatism. Cities like Beijing and Shanghai do not have daytime slots, so serving them would have meant flying at night. Fares are high enough that extra capacity, with even some discount, could see demand. But this plan was put on hold when China-Japan relations frayed. Peach's Osaka Kansai base is a 24-hour operation, unlike Tokyo Narita. Haneda is also a 24-hour airport but with some slot limitations. Japan's newest LCC, Spring Airlines Japan, has increased capital. The Narita-based carrier raised its capital from JPY6000 million (USD60 million) to JPY6900 million (USD69 million) with the number of stocks increasing from 600,000 to 780,000. The newly issued stocks are preferred stocks of Type A with no voting rights and were reportedly issued to a new but undisclosed shareholder. 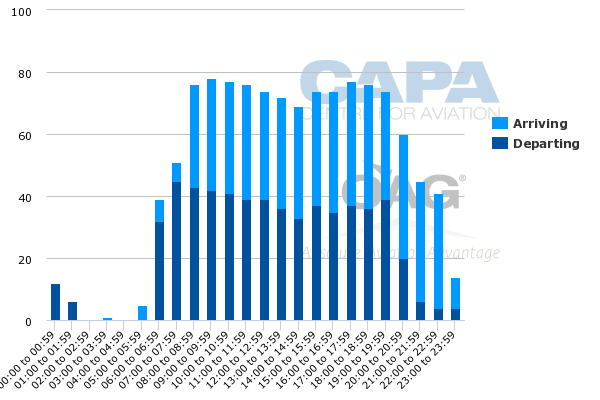 As CAPA previously noted, Spring's initial performance has been less than optimal as its three 737-800 fleet is under-utilised, operating only a daily return from Narita to Hiroshima and two daily returns each to Saga and Takamatsu. Its load factor over the popular New Year travelling period was only 64.6%. 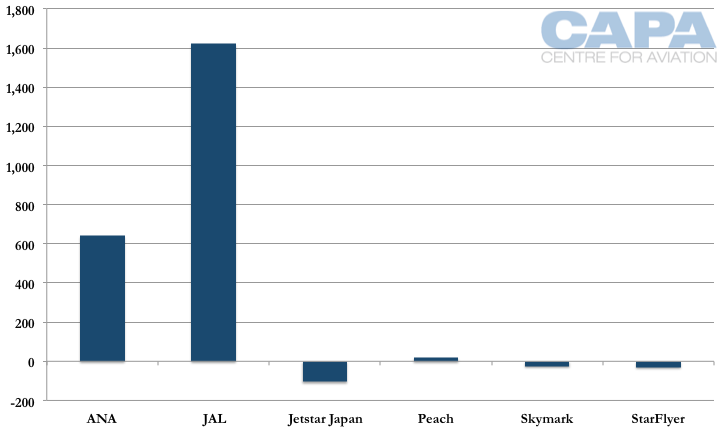 Further, initial yield information shows Spring Japan's yields were half those of Peach and Jetstar Japan. However, this was during Spring's start-up phase and its brand recognition is still building. The carrier has had to launch in the domestic market even though its long-term focus is international services, especially to China, where parent Spring Airlines is based. Progressive visa liberalisation between Japan and China will be to Spring's advantage. It is still early days in the story of Japan's new LCC market. Peach has clearly performed best and will consolidate its position with greater service from Tokyo. Spring Airlines Japan is showing worrying signs, but it is still young and yet to serve the international markets it plans to focus on. AirAsia Japan, which now plans a late 2015 entry instead of mid-2015, will launch in a busy market, but in the quieter pocket of Nagoya. The short history of LCCs has already been dynamic with the AirAsia-ANA JV collapse that gave birth to Vanilla Air. Vanilla Air could have the greatest challenge, forcing ANA to think if the LCC – even if profitable – adds strategic value. The equation, especially for ANA, will remain complex and effectively unstable. Peach is making bold moves in Tokyo, but no doubt it would be willing somehow to promote consolidation and add to itself some Vanilla flavouring. Meanwhile, ANA's strategists must be looking for a new formula that will deliver some coherence to what is more a result of happenstance than of any clear plan.